As announced, in May the plan was to test a bigger 144 MHz setup. 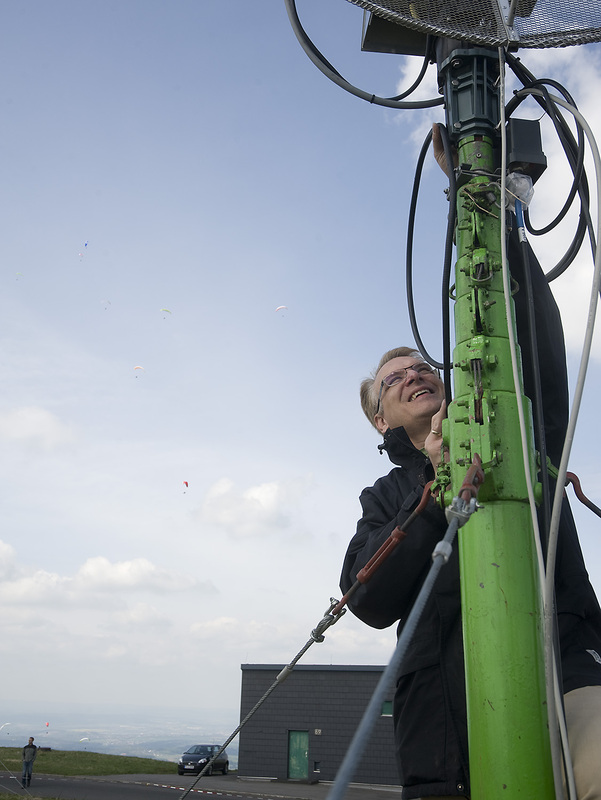 But our plans changed - Helmut had to cancel the activity a few days before the contest weekend. So again we were seeking asylum at DA0FF, this time taking 70 cm, 23 cm and 13 cm with us. There was not much time left for preparation. But we repaired the broken 13 cm masthead amplifier - the coaxial relay was dead - and collected the material for a second mast. The holiday on Friday helped a bit, and DF9IC arrived with the packed trailer around 9 pm on site. DF5HC and DL8AAU joined the next morning. 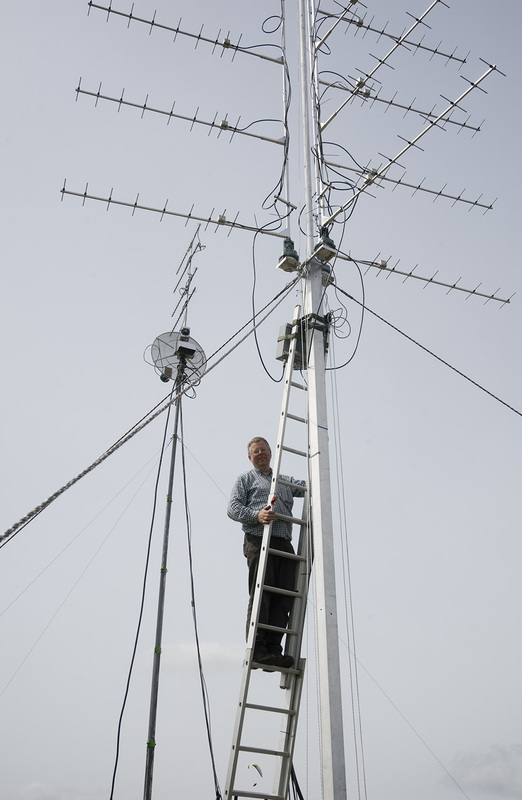 DA0FF had done a great job and all 2 m antennas were already installed on Friday afternoon. We then had the Saturday available for our work. 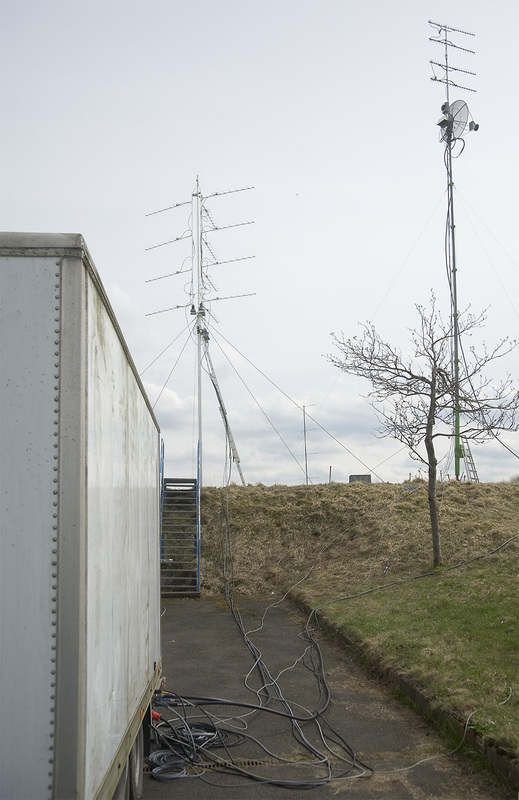 It was easy to set up the 432 MHz antennas with the experience from March, and this time we had no 23 cm on the same mast, because of the weather forecast with stronger winds. 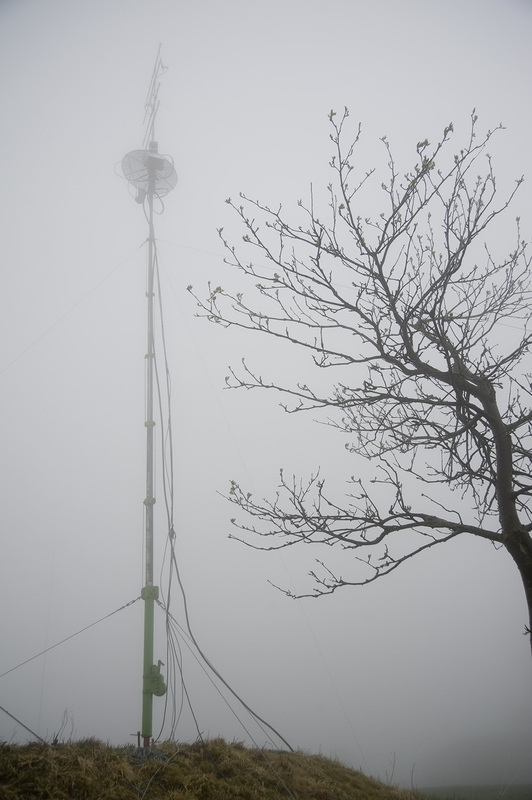 The other antenna system on a 10 m crank-up mast from DF9IC caused more problems. The cable loop over the rotator always got caught somewhere, there was not enough space to fix everything properly. This problem reappeared from time to time during the contest and prevented us from turning the rotator as needed. 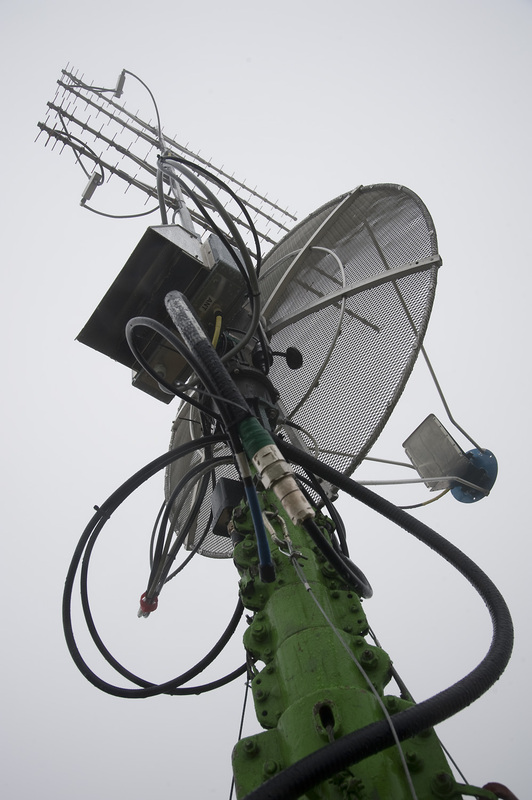 For 23 cm we used the same 4 x 23 Tonna as in March, and for 13 cm a 1.2 m dish with broadband feed horn, both on the same rotator which does not allow independent operation. This was a compromise caused by the short time to prepare the setup. We were ready for the contest in time. 432 MHz started slower than in March, and it continued like this, so the result was less pleasant. On 23 cm we had the same high noise level again, though Peter DB8ZP was very helpful and had switched off the local ATV repeater DB0TAN. We used part of our time to chase the noise source, but could not really localize it. 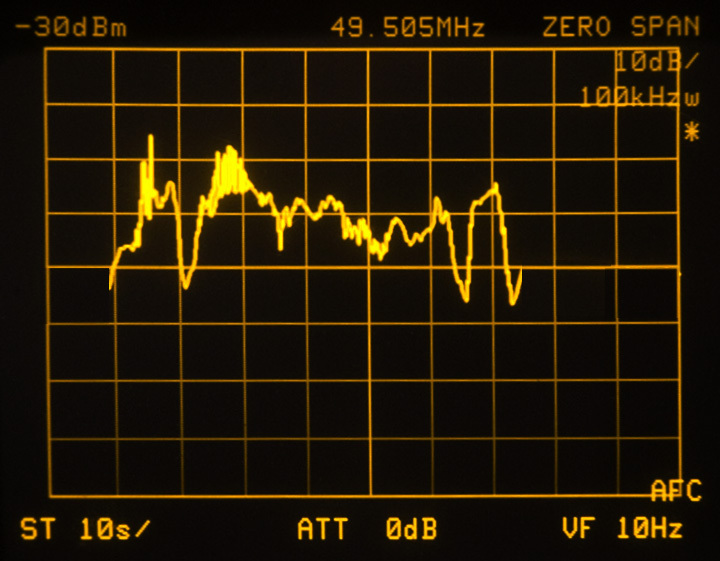 For some time we suspected DB0RHN (DVB-S ATV repeater) on the nearby Heidelstein but after driving there with the spectrum analyzer and measuring the signal, together with some calculation, it was clear that it could not cause this noise level. This is the relative power level on 1295.5 MHz (measured at the 50 MHz transverter output after amplification) turning our antenna one full rotation, starting at 340°, about 55°/div. Nearly everywhere we had 10-20 dB excess noise which prevents any serious operation. Like in March this noise dissappeared now and then for some time. Obviously it is not of ham radio origin, but seems to come out of the nearby building. There is also a pulse signal present around 1294 MHz which seems to come from another, more distant source. So 1296 MHz is not a good choice at this QTH. 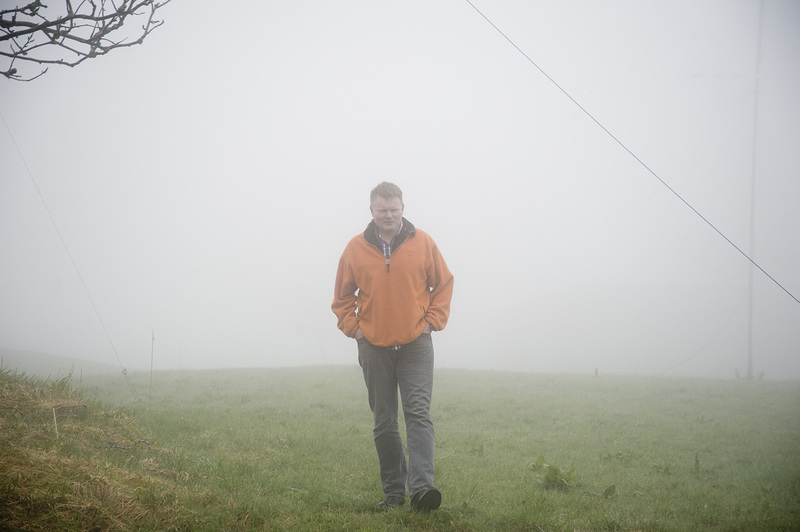 Sunday morning started like the weather forecast has predicted: with thick fog. We could barely see our antennas. And it continued like this the whole day, accompanied by increasing rain. The "Wasserkuppe" did credit to its name. The QSO rates on all bands were low, too. 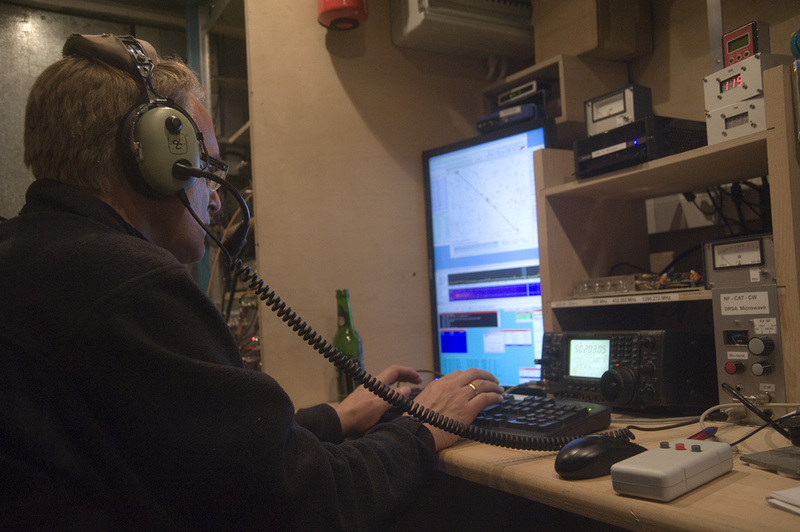 The 144 MHz result still is quite good, with over 1000 QSOs in the end, but 70 cm stayed below 350 QSOs and just reached 100k points. 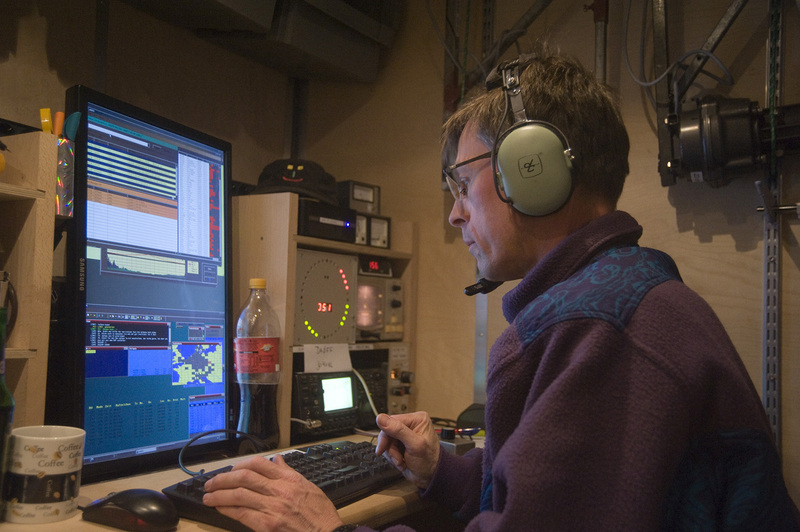 This was less than expected, and more than 100 QSOs behind our competitors from the Schneekopf (DL0GTH) and our own result from March. So we were happy when everything was taken down again, and we could start the path home. 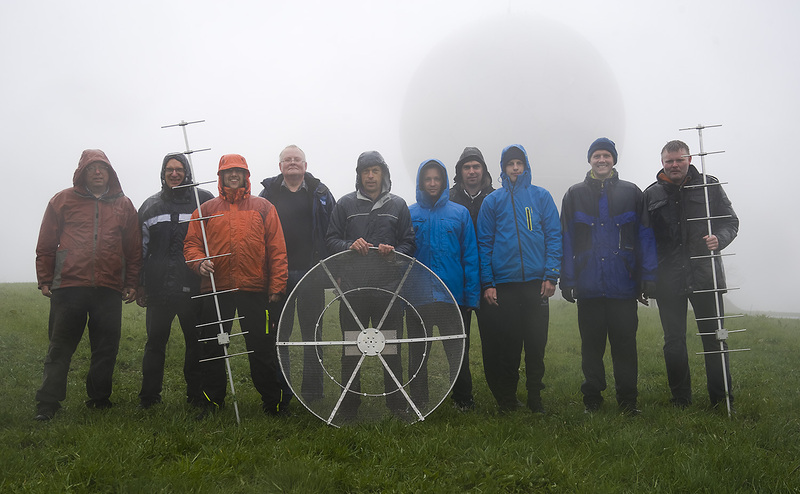 From left to right: DF9IC, DL8AAU, DK5MX, DJ4FM, DF5HC, DO1HDR, DL2ZXA, DO9EE, DK5OH, DL4XX. - DL6FBL had to leave earlier.